Just a few steps into the state of Indiana, there's this little cafe on Ridge Road that puts out some pretty amazing stuff - savory pies, hand pies, warm pressed sandwiches, soups, slaws, buckles, cinnamon rolls, quiches and lots of other goodies. They also do some pretty awesome salads. And now you can get them ready to go, so you can grab one when you're in a hurry and be on your way. When I stopped in recently for a sandwich, I got a chance to sample the Thai Crunch Salad pictured here. 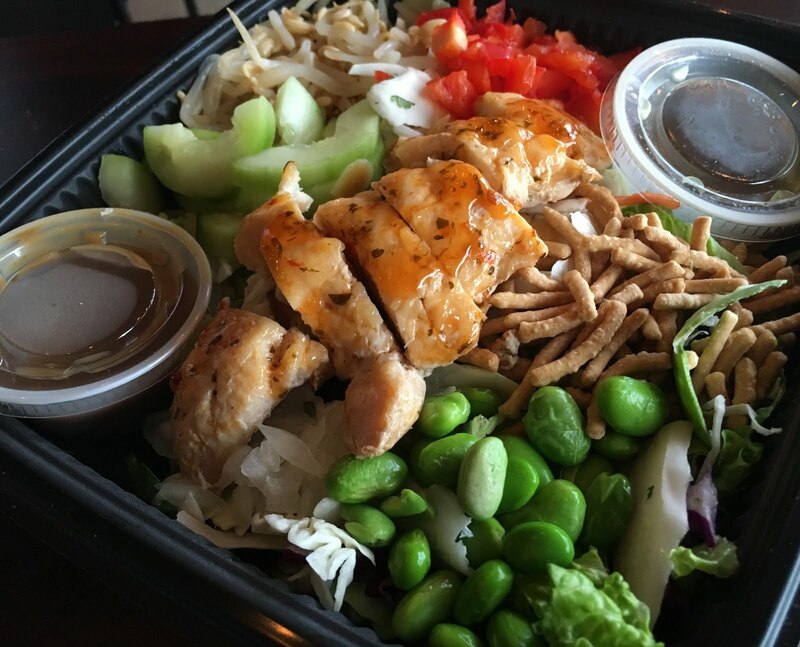 It included lettuce, carrots, cabbage, crunchy noodles, cucumber, edamame, sprouts and sweet chili glazed chicken with a toasted sesame dressing and honey lime vinaigrette. A nice blend of flavors and textures and a hefty portion for $7. Stop in to see what else is on the menu (it changes daily.) Another salad I've had there that I really love is the Bistro Bacon Avocado Salad. So, if you stop in and see that on the board, give it a try. Follow on FB where the daily menu items are frequently updated. ***I did receive a complimentary salad for the purpose of a review. I was not compensated for this post. All opinions are my own.